Just a quick lunchtime update here. 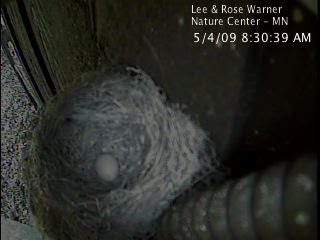 I checked out our Eastern Phoebe Webcam this morning when I got into work. We've been expecting an egg soon. The female has been roosting in the nest at night but absent during the day. This morning, I came into work and checked the live feed. Voila! The first egg. The bird should lay one egg each morning now for the next four days or so. She does not begin incubation until all eggs are laid.